I’ve spent the past few weeks going through the original Devil May Cry games in preparation for DMC5, a journey which has been enjoyable, frustrating (thanks to DMC2 mostly) but most of all, memorable. It’s a series that is completely over the top, silly, cheesy, but somehow brilliant. I was surprised we got a 5th entry after the DMC reboot, but clearly that has been disregarded to pave way for a true sequel to DMC4. But after all this time, does Dante and friends have what it takes to keep up with the competition? The game is set several years after DMC4 and you begin as Nero, who has lost his demon arm courtesy of a demon you are about to face off against. 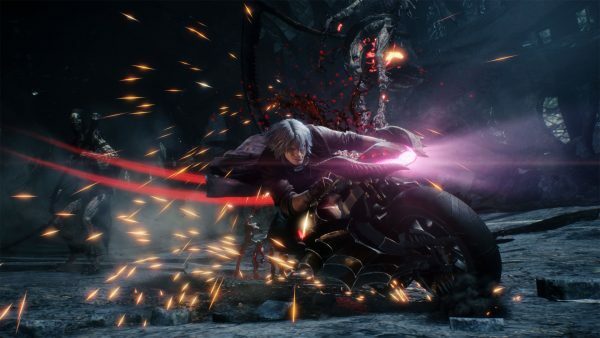 Dante, Trish and Lady have already given it their all to no avail and Nero is forced to leave by Dante by the mysterious new character V before all is lost. 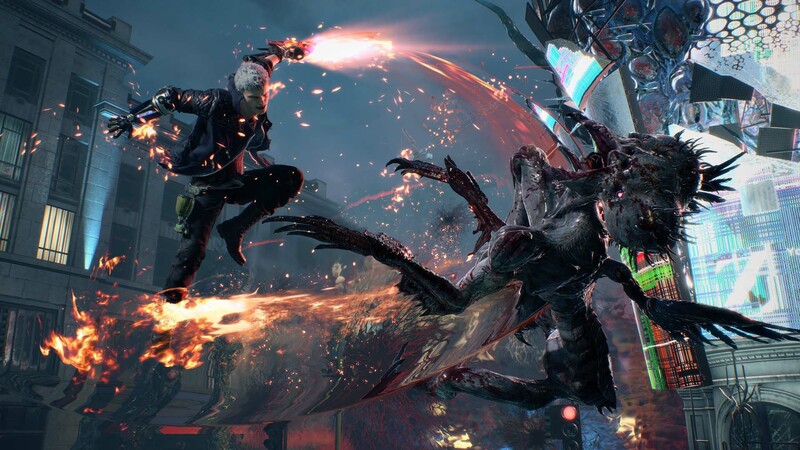 The game jumps back and forth filling in the blanks as to how they ended up fighting the demon, how Nero lost his arm and the origins of V. In typical DMC fashion, a lot of it is crazy and cheesy, but it is a well done story and definitely the best in the series. For those unfamiliar to the story, there’s even a catch-up video that explains the events from the games, even in the right timeline since DMC3 is actually a prequel. I did laugh that it showed the DMC2 logo for all of two seconds and not mentioning its story, then moving straight onto DMC4. In terms of gameplay, DMC5 will feel familiar to those who have played past entries…but there are new moves and abilities to learn, including Nero’s new robot arms and new character V’s summoning fighters to attack for him. V is an interesting one as he is too weak to engage in combat other than striking a finishing blow with his cane that has a blade attached, so by tapping Square or Triangle summon attacks from a lion or a sarcastic-talking bird. You are also introduced to new character Nico who works on your upgrades and can be called from any phone box, turning up in her van in any number of ridiculous locations to give you the option to trade in your red orbs for new moves, new items or new arms for Nero. Nero can lose his arms if he is attacked while using them, but luckily they can be found as you explore, as well as buying them from Nico. In terms of visuals, DMC5 is something special. It uses the RE Engine from Resident Evil 7, which also was used for the recently released Resident Evil 2 and pushes the PS4 to it’s absolute limits, running at 4K HDR and a steady framerate. The heavy metal soundtrack is brilliant as always, while voice-acting is a mixed bag of cheesy and the dramatic, which is to be expected from the series. After a long time, Devil May Cry is back in true form with DMC5. It’s the best in the series to date and shows that there’s still plenty of life left in the series, also introducing new moves and a new character while looking badass from start to finish. It’s insane, cheesy and brilliant. Just as it should be.